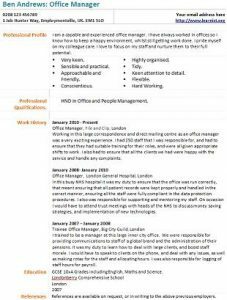 Office Manager CV example and template. Amend it as suitable and start using it for your job application. This CV example is also available in different formats. Office Manager job vacancies can be found on the major job sites online including Learnist.org, cv-library.co.uk, reed, totaljobs, Jobsite etc. Visit those job boards and start searching for current vacancies and apply for the ones that are near your or you are prepared to relocate for. – View very well written covering letter examples! – Typical interview questions answered for you! – Visit job seekers forums today to ask your career related questions. I am a capable and experienced office manager. I have always worked in offices so I know how to keep a happy environment, whilst still getting work done. I pride myself on my colleague care. I love to focus on my staff and nurture them to their full potential. HND in Office and People Management. Working in this large correspondence and direct mailing centre as an office manager was a very exciting experience. I had 250 staff that I was responsible for, and had to ensure that they had suitable training for their roles, and were all given appropriate shifts to work. I also had to ensure that all the clients we had were happy with the service and handle any complaints. In this busy NHS hospital it was my duty to ensure that the office was run correctly, that meant ensuring that all patient records were kept properly and handled in the correct manner, ensuring all the staff were fully compliant in the data protection procedures. I also was responsible for supporting and mentoring my staff. On occasion I would have to attend trust meetings with heads of the NHS to discuss money saving strategies, and implementation of new technologies. I trained to be a manager at this large inner city office. We were responsible for providing communications to staff of a global brand and the administration of their pensions. It was my duty to learn how to deal with large clients, and boost staff morale. I would have to speak to clients on the phone, and deal with any issues, as well as making rotas for the staff and allocating hours. I was also responsible for logging of staff hours for payroll. Click here to download Office Manager CV Template in doc/word format and start using it. These CV templates are the copyright of Learnist.org, 2012. Jobseekers may use these CV examples for their own personal use to help them create their own CVs. You are most welcome to link to https://www.learnist.org/operations-manager-cv-example/. However they may not be distributed or made available on other websites without our permission. If you have any question then contact us!